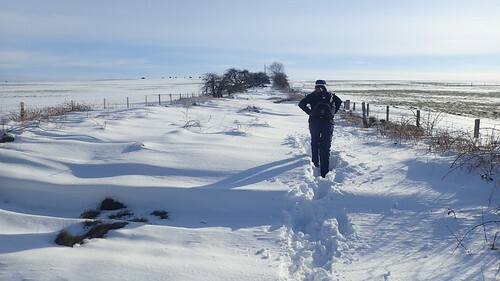 After two days of walking in the snow, you might think I’d have had enough of the white stuff and sub-zero temperatures. 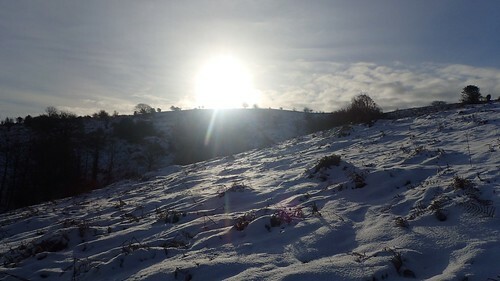 But my biggest adventure was yet to come, with a visit to the Mendip Hills. Only a short drive from home but, until now, I hadn’t even picked up my keys to drive anywhere in this weather. This was a walk I’d planned to share with someone. 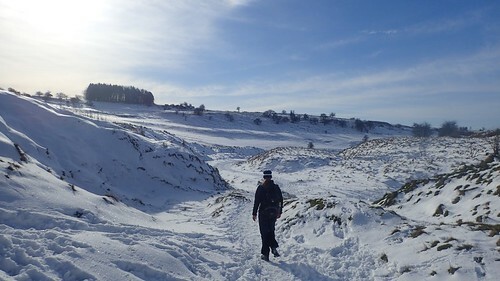 Initially, we were destined for the Brecon Beacons… But the forecast cold temperatures turned us away from that idea. I hesitated over a drive south to Exmoor but, again, with the temperatures falling low and hills rising high, it didn’t seem like the most sensible of options. 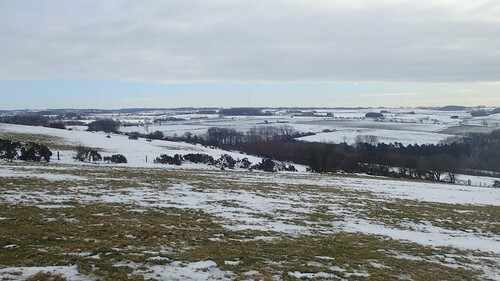 Across much of North Somerset, the big freeze had already begun to thaw – more than forty-eight hours after the first flakes of snow fell. 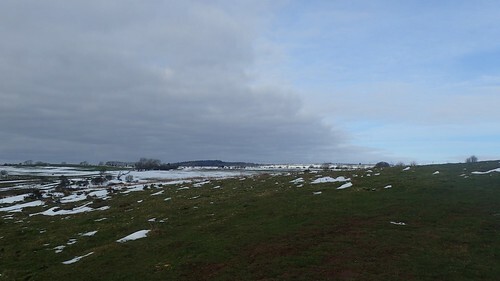 With many of my local paths around Wrington already fading to slush and thin ice, I didn’t expect to find much left on top of the Mendips. We left the ‘Goatchurch Cavern Car Park’ at 9:00, with a temperature no higher than -1°C. Honestly, stood in the shade of Burrington Combe’s limestone cliffs and even with full thermals on, I hadn’t felt this cold in a very long time. From the car park, we walked a short way along side the road until we followed a rocky path up alongside West Twin Brook and in to the hills. 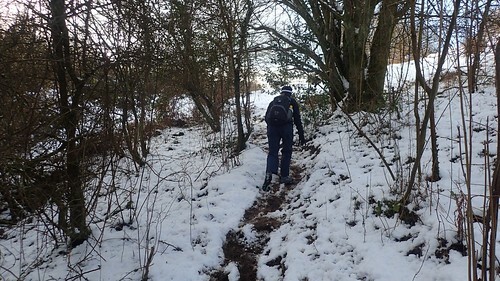 People had been up here in previous days, which meant that the footpaths had already been ‘cleared’, so to speak and that navigation would be less of an issue. This initial climb to the top of Black Down is a test of one’s endurance… Certainly the best you’ll get within a few miles of the area. It was a great experience, to find pliable snow above our ankles and sunlight decorating the landscape in a way that wouldn’t have been seen, two days earlier. 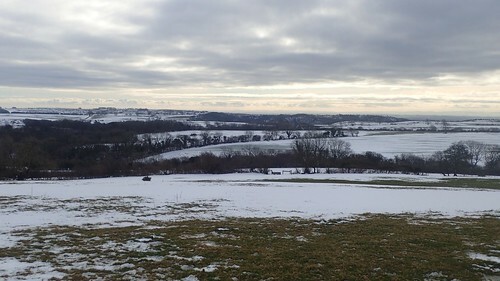 Here’s a view looking back down to Wrington and offering an idea of how far I didn’t have to drive for this walk. As I may’ve mentioned in a previous post; I’m looking at moving away from this immediate area and in the near future. 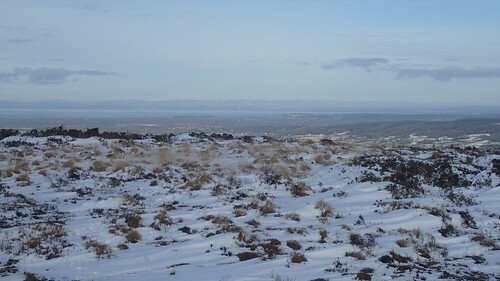 Nearing the top of the ridge, I spotted what I thought looked like a ‘snow elephant’ from a distance… We wandered over – wading through the snow that was now up to our knees. A couple of people on social media have suggested that it might be a curlew… I’d love to know who built it and why. 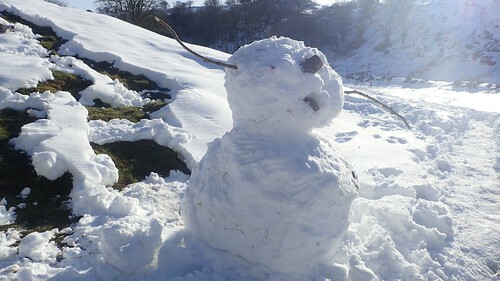 This is currently my favourite snow-built creation I’ve seen in person. An unclear view, looking towards a distinctly-green Weston-super-Mare. 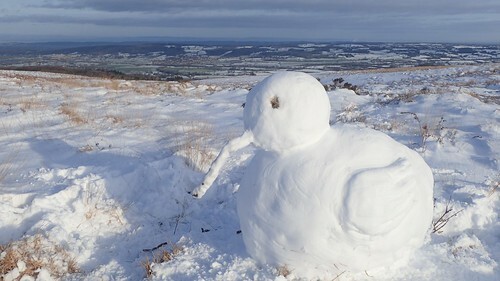 My companion had commented on how the snow had departed so much of the county already. She was as surprised as I was, to find so much still surrounding these hills. 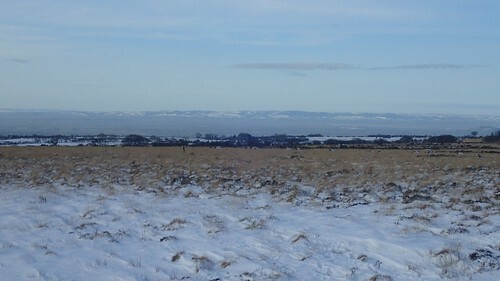 Those aren’t clouds but the snow-capped summits of the Quantock Hills and stretching west in to Exmoor. I think we made the right decision to stay local! But this hills are rarely so clear to pick out from here, even on a clear and sunny day. 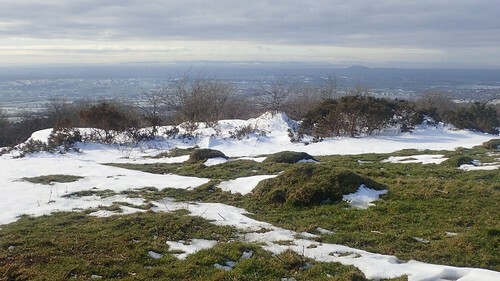 Looking across the Severn Estuary and on to South Wales, we couldn’t see much in the way of snow on the highpoints of the south-east. It’s entirely possible that the mountains of the Brecon Beacons National Park and even the Black Mountains were too faint to determine from the next… I’ve been up there in snowy weather and social media would suggest at the time that a lack of snow in that region was unfathomable. 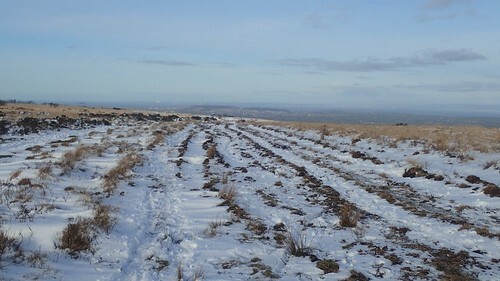 From Beacon Batch – the highest point on the Mendips at 325m above sea level – we continued east towards the twin transmitters, having passed only two other walkers and a pair of struggling cyclists, by this point. Suddenly, we found ourselves faced with drifts reaching up to our waists. 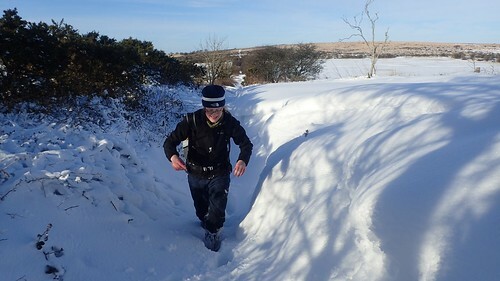 Striding further on and the snow levels had risen close to my own neck… Incredible! It may be worth pointing out that a small group of crazy trail runners had decided to hop over in to a private field and continue parallel to this right of way… We decided it would’ve been less fun to have followed them. 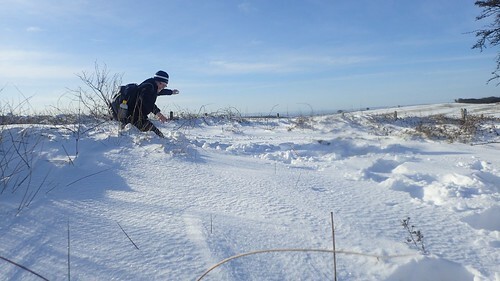 Following in my expert lead, we would rolling across the deepest drifts was actually easier than trying to walk forwards in a slow and tiring motion. Crawling also works, until you find your hands and face sinking instead! Neither of us had packed tennis rackets or skis, which would’ve also helped. We both laughed. Lots! A joyous and challenging experience shared. A proper adventure and only one hour in to the walk. 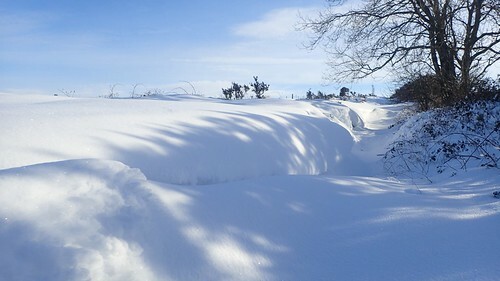 If the snow leading up and on to Black Down had been a surprise… We could’ve fainted at the sheer discovery of these mammoth drifts. We lost all sense of time, in fighting our way through, out and over. 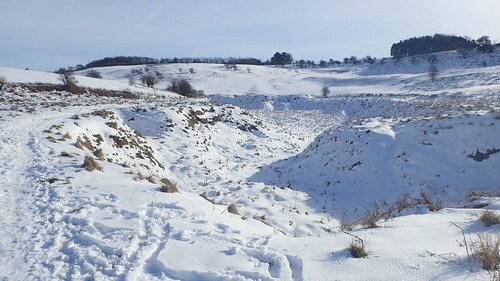 We walked a good half-distance of the path, before conceding defeat at the sight ahead and scrambling over a barbed wire fence and reluctantly following in the lead of those runners (and, according to the footprints, the many others who’d passed before them). Eventually passing the wireless station, we found the “road” ahead at Rains Batch was just as bad as what we’d evaded… Over a metal gate, following in the footsteps of others and down to the next road, we were trespassing again. Braving the icy surface of this road in to Charterhouse, we made our way down to Blackmoor Nature Reserve, which had seen its fair share of foot traffic over the weekend. 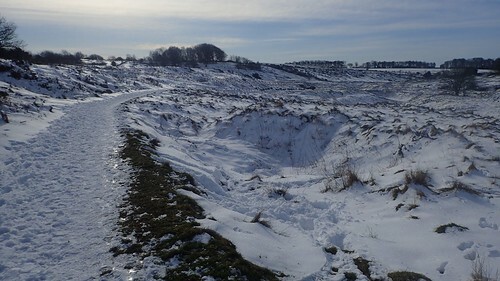 We bypassed Ubley Warren on our way to Velvet Bottom – this was a repeat of a group walk I led in December. Albeit, under properly wintry weather conditions. On crossing the rural road where dog walkers frequently park, my companion took a frightful slip on the ice, in an instant so fast that neither of us could react. She landed on her arm and back but thankfully, nothing was broken. Worst of all was the shock and the few moments it took for her to compose herself and find her feet… Had she not been wearing a backpack, I fear she might’ve hit her head. Hard. We passed a number of people who were walking without even a small backpack. Snow and ice can be beautiful but the risks are not to be taken lightly. Slow and steady, we continued our walk towards Cheddar Gorge. Ahead of which, we’d join the West Mendip Way near Black Rock. 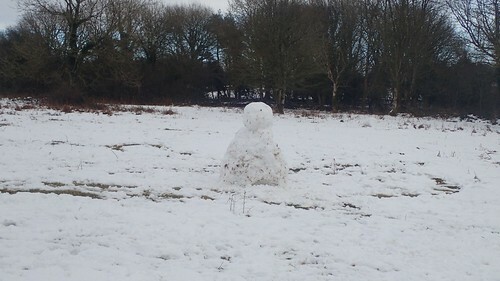 At the junction with the Mendip Way, we met a more traditional snowman… Missing his head and perhaps a hat and scarf, if you really like. 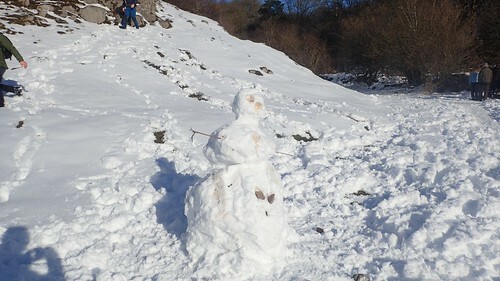 It was while walking towards the gorge road that I spotted what I thought was a familiar face ahead of us (not the snowman)… Although, this wasn’t someone I’d met in person before. We follow each other on social media and he added me on Facebook a few months ago. I wasn’t certain it was him and so, I decided to keep my head down. But as we passed close by, he stopped and recognised me – I’m always amazed that people can do that. It was good to finally meet him – a chance encounter that almost happened before Christmas, when I was filming a timelapse from Draycott Sleights and he was flying his drone, meters away to my left. It is a very small world, at times. I can add this encounter to the owner of a stopped car who turned out to be someone I’d recently started following on Twitter and to an incident last year, where I crossed the road in front of a car that gave way, only for the driver to later mention that they recognised me from my photos! Instead of crossing the gorge road, we left the West Mendip Way at a junction, where the fingerpost gives distances in metric units only (why, I do not know). 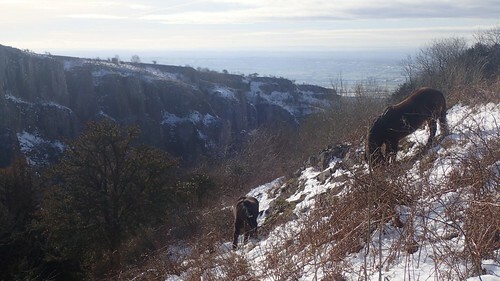 From here, we climbed steeply uphill on a slightly icy path and would join the National Trust’s Gorge Walk, before climbing further steps to the cliff tops. Horses continued to graze this space, just as they had done on a grey but dry day in December. 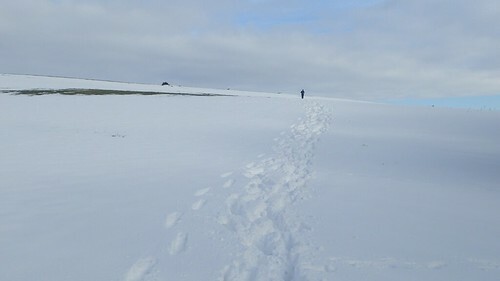 From snow, through mud, to snow once more; we then found ourselves treading across patches of green grass. Our vantage overlooking the Somerset Levels was quite something. Although, I don’t think I’ve captured as well as I might’ve, due to the volume of snow in the foreground. 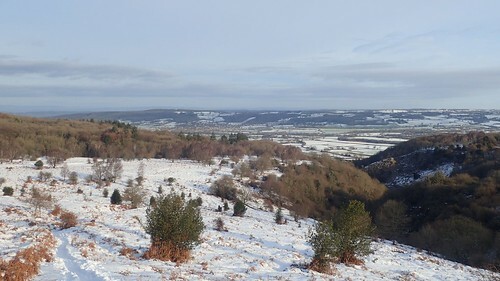 From the top of the gorge, we would begin our return towards Black Down, with heavy cloud rolling in from Rowberrow to the west. No rain had been forecast for this portion of the day and we’d continue the walk without any further weather incidents. South of Beacon Batch, we crossed a true whiteout, heading north to the combe road (where more cars than you could imagine had decided to fill every roadside vacancy). 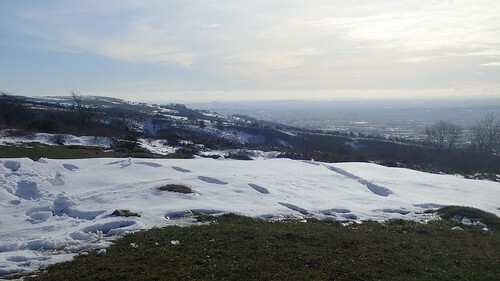 We’d climb up on to Burrington Ham from here and then begin a gradual descent towards our cars. My usual plan from here is to walk close to the cliff edges, overlooking Burrington Combe below and then, to find my way through the woods along unmarked paths and then a descent, following a valley to reach the road. But it’s not on the maps, it isn’t waymarked and I doubt many walk it very often. On my own, I might’ve investigated further. But with company – and taking in to account the fortune of a slip earlier in the day – I led us down a more definitive bridleway and in to Burrington village, from which we’d return to the combe road and our cars along tarmac. 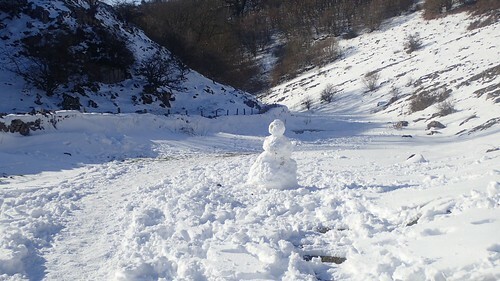 And missed out on an unforgettable winter experience! 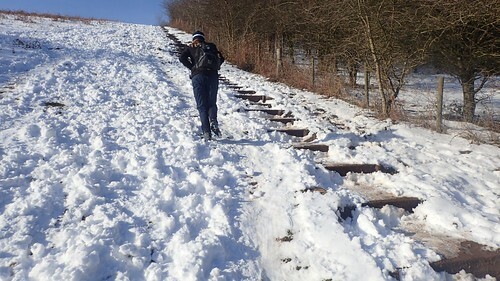 For future reference, I am considering investing in a pair of ‘snow grip’ attachments for walking boots… They’re almost like a simplistic version of crampons. But much less expensive and hopefully good for crossing frozen paths. I considered buying them a year ago, before deciding that the south-west of England doesn’t receive enough snow to justify the purchase…! 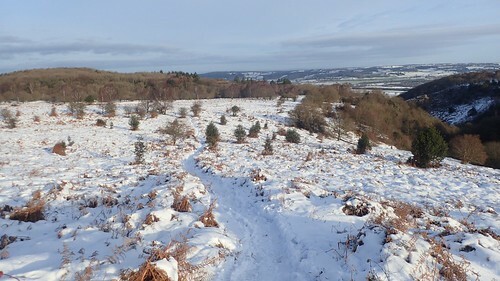 This entry was posted in Mendip Hills and tagged AONB, Black Down, Black Rock, Blackmoor Nature Reserve, Burrington Combe, Charterhouse, Cheddar Gorge, hiking, Mendip Hills, Mendip Snow, Mendips, National Trust Gorge Walk, Snow Day, snow drift, Somerset, trespassing, UK, Velvet Bottom, Walking, West Mendip Way on 08/02/2019 by Olly Parry-Jones.